Would you drive this ice block around? Mercedes-Benz has a new G-Class SUV. It recently showed it off at the North American International Auto Show at Detroit last month. The new G-Class looks a lot like the old, but with all sorts of updates. The legendary styling deserved to stay, and we’re glad Mercedes kept it. How legendary is the styling, you ask? Good enough for Siberian tuner Garazh54 to build a G-Class replica out of ice. Ever wonder why automakers don’t build cars out of ice? Neither have we, but thankfully this brave tuner has. Well, the model isn’t completely built of ice. The vehicle uses the platform and engine from a Soviet-era UAZ jeep, according to Siberian Times. From there, the tuners built a somewhat G-Class-shaped frame that you can see above (photo via Garazh54) to which they added ice blocks in a kind of igloo style that were cut and shaped with a chainsaw. There are no windows as you can see in the finished product below (photo via Garazh54). 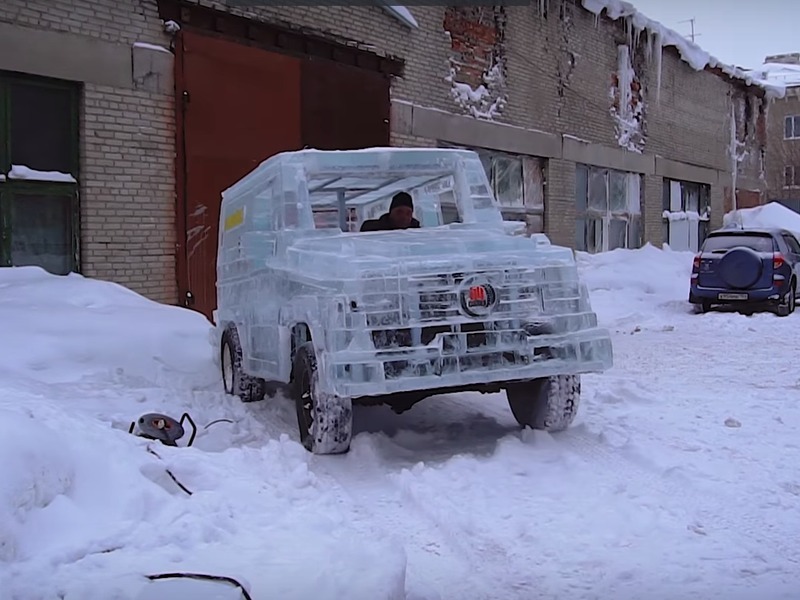 Apparently, the tuners used six tons of ice to construct the boxy ice cube of a vehicle. This is no simple sculpture either. You can actually drive this thing as head of Garazh54 Vladislac Barashenkov demonstrates in the video below. The model is equipped with funky, colorful lights and is pretty eye-catching. Still, if it were our car, we’d want some windows. If it’s cold enough for a car built out of ice, the last thing we want is to experience wind on our cheeks.